The AACR debuted at its annual conference today an informative video about the accomplishments and possibilities of cancer research. Check it out. 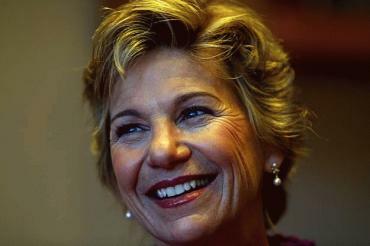 Dr. Susan Desmond-Hellmann was profiled in the Sunday, April 11, 2010 issue of the San Francisco Chronicle. The story was featured on the front page. It provides a personal look at what drives the new leader of the University of California, San Francisco (UCSF). I was fortunate to have worked with Dr. Desmond-Hellmann while at UCSF. For me, she is a role model. Dr. Desmond-Hellmann is credited with helping to create an industry powerhouse (Genentech) and bringing the world’s most successful anti-cancer drug treatments to market. These include Rituxan, the first drug to use monoclonal antibodies, which works by attacking specific types of cancer cells; Herceptin, the seminal drug which opened the doorway to personalized medicine by targeting the HER2 gene, which defines a specific subtype of breast cancer; and Avastin, the first angiogenesis inhibitor to stop tumors by preventing the formation of new blood vessels. Desmond-Hellmann has been both a champion of and game changing pioneer in oncology translational research – taking the basic understanding of biology, science and technology and using that deep understanding for the direct benefit of patients. She helped fundamentally transform the way we research and treat cancer, and improved and helped extend millions of lives worldwide. Today, as Chancellor of UCSF, she is taking her experience to the next level and applying it to finding treatments and cures for an even broader array of the world’s most devastating and unsolvable diseases. The future of this great institution is in good hands. fighting cancer during her recent keynote address to UCSF’s breast oncology leaders. She describes 1997 to 2001 as oncology’s golden years. Rituxan, Herceptin and Gleevec debuted and changed the face of cancer treatments. Dr. Desmond-Hellmann believes that academia can today play a critical role in introducing “the platinum age” of cancer drug development. “Cancer research is too slow, too expensive, too inefficient and too uncertain…we need to understand earlier and with greater confidence what the best ideas are,” she says. Read the full article here. “What’s really neat about the I-SPY trial is that Laura Esserman, the PI of the trial, is a breast cancer surgeon here at UCSF and has added so much value to the project because she sees patients early and has a unique opportunity to offer neoadjuvant therapy. “It’s a fantastic rapid readout model so you can get answers much more quickly in a year, including pathological specimens, along with the answers from biomarkers and imaging, which are important. Read about the i-Spy 2 adaptive clinical trial which was launched on March 17 in Washington. A new approach to delivering gene therapy to the brain to treat neurodegenerative diseases such as Alzheimer’s, was revealed in research findings published in the February 4 online edition of the Proceedings of the National Academy of Sciences. Bankiewicz’s research at UCSF has a strong focus on the development of practical approaches to gene and cell replacement therapies; he synthesizes several individual technologies into powerful new approaches to the treatment of such serious disease as brain cancer and neurodegenerative disorders, including Parkinson’s disease. Many mutant proteins are not druggable. Cancer can adapt to tolerate targeted therapies. Current process of developing cancer drugs is not working. UCSF is developing a new paradigm of drug development through its pioneering siRNA research. To learn more, visit UCSF’s Helen Diller Family Comprehensive Cancer Center site. Charlie Mingus’ words of wisdom on creativity. Chade-Meng Tan speaks of everyday compassion at Google which he calls “Search Inside Yourself.” According to Meng compassion works in 3 steps: attention training, self-knowledge and spreading happiness. I am quoted in a San Francisco Business Times article about UCSF’s pioneering effort to use social media to connect with patients, caregivers and donors. I am quoted in an Economist article about the launch of the original iPad.